The Breakfast Birdfeeder is an easy homemade birdfeeder craft that even toddlers can create. It's a great way to help you child invite birds into your yard! 1. With a pen or pencil punch holes into your bread slices and if not toasted, leave out until stale (overnight). 2. 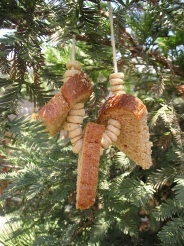 Using your yarn, string together the bread crusts and cereal and find a great place to hang it in your favorite tree! Soon you will have some little friends in your yard! Click here to find more Birdfeeder Crafts like the Breakfast Birdfeeder!